To establish the extent of anterior chamber angle circumference needed to maintain a physiological outflow facility (C). This could create a model to investigate focal outflow regulation. Twenty anterior segments of porcine eyes were assigned to five groups, each with a different degree of cyanoacrylate-mediated angle closure: 90° (n = 4), 180° (n = 4), 270° (n = 4), 360° (n = 4), and four unoccluded control eyes. The outflow facility was measured at baseline, 3, 12, 24, and 36 h after angle closure. Outflow patterns were evaluated with canalograms and the histomorphology was compared. Baseline outflow facilities of the five groups were similar (F = 0.922, p = 0.477). Occlusion of 360° induced a significant decrease in facility from baseline at all time-points (p ≤ 0.023 at 3, 12, 24, and 36 h). However, no difference from baseline was found in any of the partially occluded (0–270°) groups (F ≥ 0.067, p ≥ 0.296 at 3, 12, 24, and 36 h). The canalograms confirmed the extent of occlusion with flow through the unblocked regions. Histology revealed no adverse effects of blockage on the TM or aqueous plexus in the unoccluded angle portions. The unoccluded TM appeared normal. Cyanoacrylate-mediated angle occlusion created a reproducible angle closure model. Ninety degrees of unoccluded anterior chamber angle circumference was sufficient to maintain physiological outflow. This model may help understand how outflow can be regulated in healthy, nonglaucomatous TM. 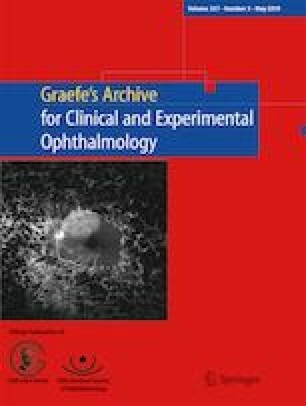 This study was funded by the Initiative to Cure Glaucoma of the Eye and Ear Foundation of Pittsburgh (NAL), by NEI Grant K08EY022737, by NIH CORE Grant P30 EY08098 to the Department of Ophthalmology, and an unrestricted grant from Research to Prevent Blindness, New York, NY. This article does not contain any studies with human participants or animals performed by any of the authors. No animals were sacrificed for the purpose of doing research. An approval by an ethics committee or institutional animal care and use committee was not required.